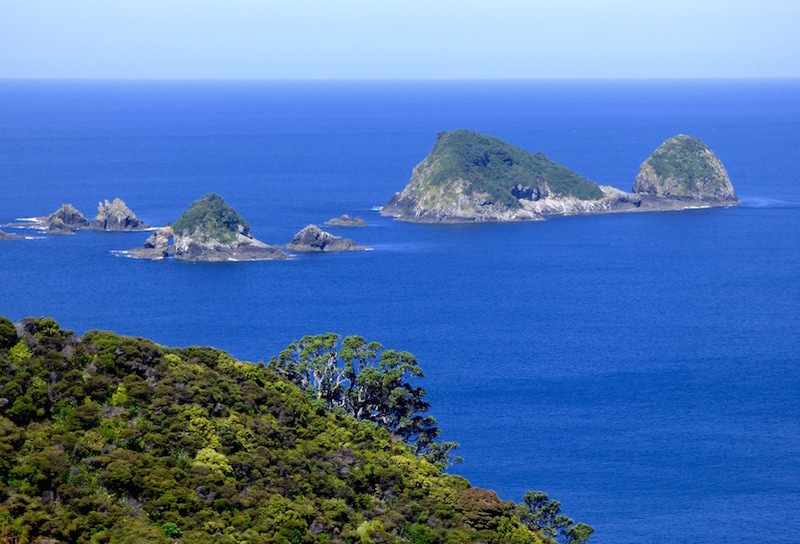 View of another part of Cavalli islands from Motukawa trail. "New Zealand's Bay of Islands gets way overcrowded around the holidays! 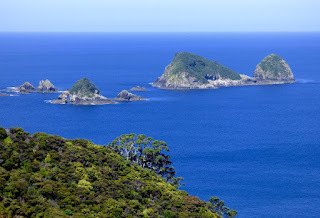 Go to further North, to Cavalli, or Whangaroa," suggested a local. Given before long we plan to relocate our boat for most of the rest of our New Zealand stay on Whangarei, seemed like a good explore Bay of Islands and North, before heading South. 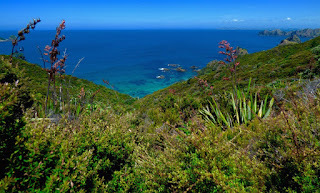 View overlooking reef off Motukawa's ridge trail. 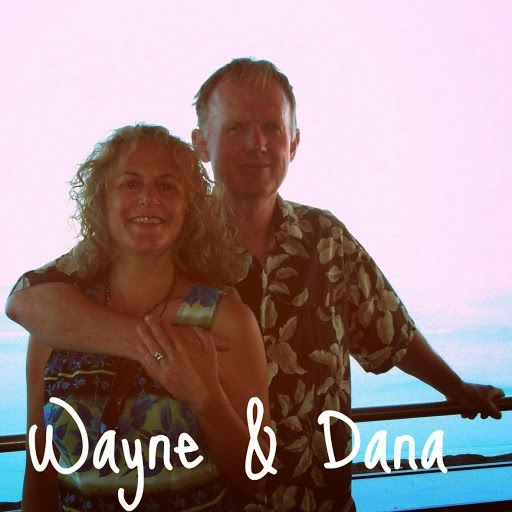 We appreciate Martha and Bryce of Silver Fern, Kiwi cruisers we met in Tonga for their list of favorite New Zealand anchorages and to Cindy and Rich of Legacy, whose blog provides an excellent Bay of Islands anchorage summary and interactive map. Their advice helped guide our choice of anchorages, cherry picking through them in our limited time in the Bay of Islands area. Zoomed view of Motukawa reef from several hundred feet up. through the Cavallis. 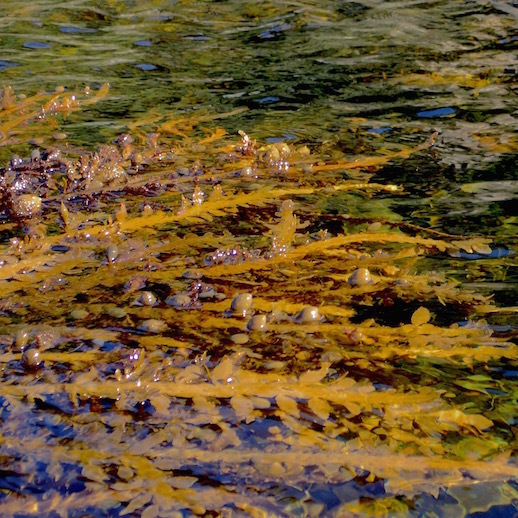 These fringed the bay East of Waiti. Exiting North out of Bay of Islands, our first stop was the largest of the dramatic Cavalli islands, Motukawanui -- better known as Motukawa, anchoring in wide Waiti Bay. 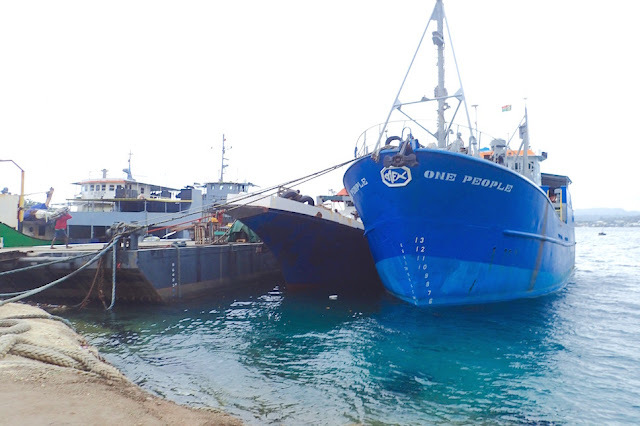 We shared the Bay with only one other boat overnight, though other boats anchored or beached briefly, then left. 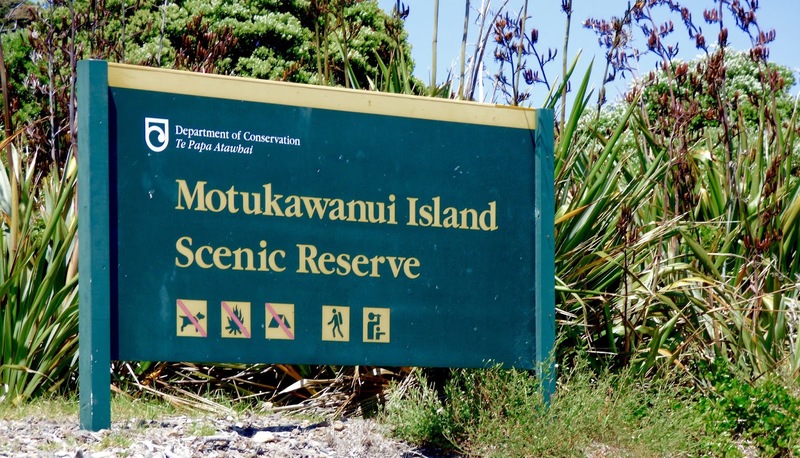 as a scenic reserve, it's a protected area. Sailing through them felt like a giant's playground, with many scatterings of long, scraggly teeth jutting up from the maw of the ocean. It makes me wonder what formed them. Investigating New Zealand's geology is definitely on my to-do list! Click here for a little background on Cavalli's geologic formation. 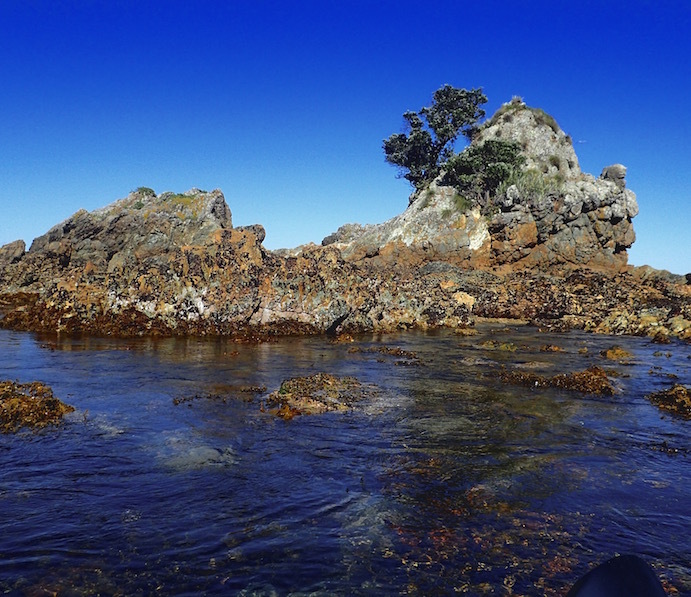 These rocks formed the Northwestern perimeter of Motukawa's Waiti Bay. The taller ones appeared to offer prime bird nesting habitat. Motukawa's dinghy-able from the mainland. The island's sandy crescent beach begged beach walking, the bay just East of Waiti, skipping the smooth pebbles that made up its shoreline. 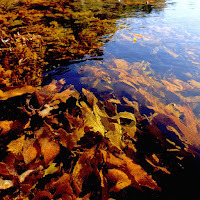 Its waters are spectacularly clear, one of two bays offer excellent shelter. A network of hiking trails traverses the island's ridges. A rich array of bird life abounds. There was even a rent-able shelter with bunks, mattresses and running water. Dusk at Motukawa's Waiti Bay. We arrived in the afternoon, and started up the ridge line trail. 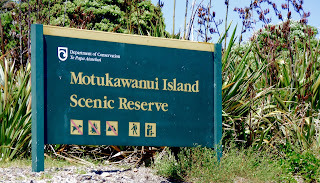 Unlike the trails at Moturua and Motuarohia (aka Roberton), Motukawa's trails quickly became steep. Within no time, the views were exceptional -- both across the islands, and down into water hundreds of feet below us yet so clear we could easily see the reef bottom. However, the recently weed-whacked trail buried wicked little pinwheel burrs that penetrated through Wayne's crocs to his feet. It was late afternoon. "How much further do you want to go?" Wayne asked. "I can wait...." Looking ahead at the trail, roller-coaster its way just as steeply, I felt decidedly more lazy than energetic, too. New Zealand Parks and Recreation rates the Motukawa trails as "easy," I would consider them more moderate, due to their steep angles. 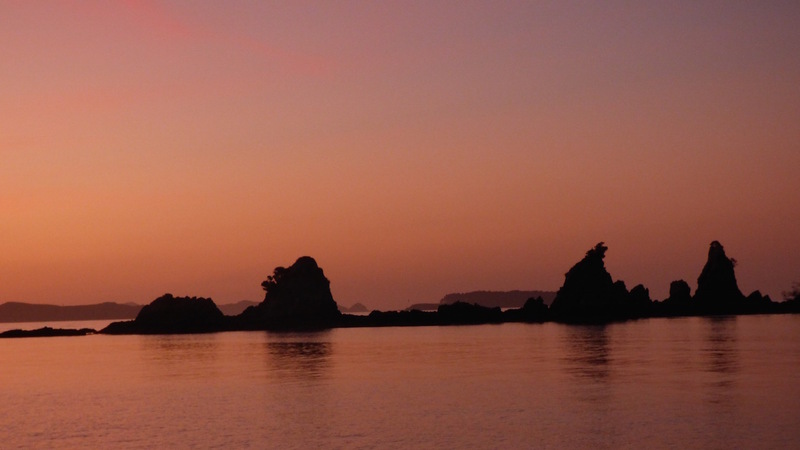 Peach sunset in New Zealand's lovely Cavalli Isles. We picked out the burrs, went a little further, picked out some more burrs, explored the bay next to ours on the way down, and enjoyed the setting sun in peaceful solitude on our boat. The next morning I kayaked most of Waiiti Bay. 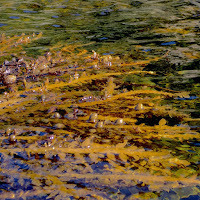 The luxurious golden kelp beds mesmerized me in the sparkling morning sun. Going with the flow on my kayak in the Cavallis. 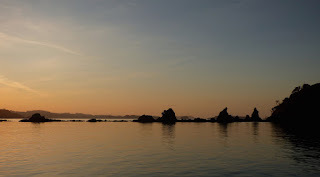 Skirting the bay's rock formations along its Northwestern edge I stressed out a variety of birds; distressed at my nearness to their nests, their voices reached a crescendo and one came near dive bombing me in my kayak, even as I distanced myself from their lair. quite unhappy with me and my kayak's presence. 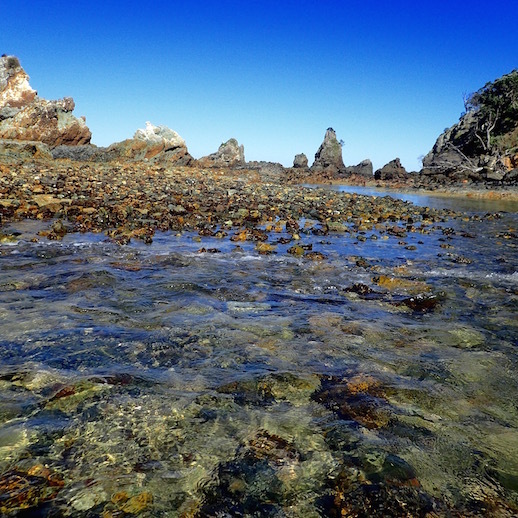 Away from the nests, edge the very Northwestern edge and deeper portion of the bay, the rocks form a sheer wall. 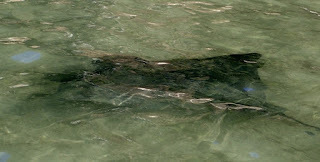 Even from my kayak, I could see a good variety of fish lurking against the wall's crevasses. With more time and a comfortable dry suit, it would be a fantastic place for snorkeling and diving. One of several stingrays near the beach on Motukawa, Cavalli islands. Approaching the sandy shore as I made a leisurely return, I was startled by the speedy scurry of several charcoal-colored stingrays. Tempting as Cavalli was, we headed off to Whangaroa. 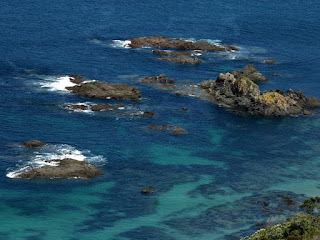 I hope before we leave New Zealand, to return to Cavalli to snorkel or dive. Hopefully I will not see so many jellyfish then (more on the jellyfish in a future post) though they didn't seem to coast through the area I was interested in snorkeling. Also nearby is another compelling Cavalli islands dive; a manmade reef ironically formed from the Rainbow Warrior, the Greenpeace falgship controversially bombed by the French Secret Service. However, if I could choose only one New Zealand dive, Poor Knights is so far the most appealing, even with the restrictions, "You are invited to swim, dive and travel within the reserve but you are not permitted to disturb the marine life or to land on any part of the islands or rocks." Martha and Bryce caution, anchor overnight only in settled conditions. Poor Knights strikes me as the closest New Zealand gets to the Galapagos for an area concentrated with wildlife. Cavalli, on the other hand, while less vivid, is still quite beautiful and much more accessible to a cruiser passing through (Poor Knights is 22 km off North Island. This is a catch-up post of our time in New Zealand's Cavallis (S35.00.454 E173.56.053), December 20-21, 2015. We are on our way to Whangarei, where our boat will stay for some time, while we do a little boat work and explore New Zealand over land. This post was written while tucked into Tutukaka Marina (S35.36.622 E174.31.668), for protection from this New Year's gales. In 2015 we sailed over 10,000 miles from the USA to New Zealand. In 2016 we are looking forward to spending far less than a third of our time under passage.